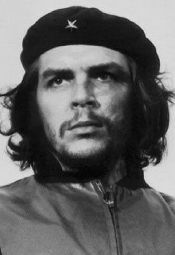 Ernesto Guevara de la Serna, also known as "Che"
9 oktober 1967 overlijden: La Higuera, Bolivia, Shot to death after having been captured in combat the day before; estimated time of death: 13:10 local time. overlijden: 9 oktober 1967, La Higuera, Bolivia, Shot to death after having been captured in combat the day before; estimated time of death: 13:10 local time. Deze pagina is het laatst bewerkt op 20:34, 28 februari 2007.